You know what I MISS? What my heart aches for every day?? John's Pizzeria on Bleecker Street in New York. ERMERGERD, it's like nothing I've ever tasted. 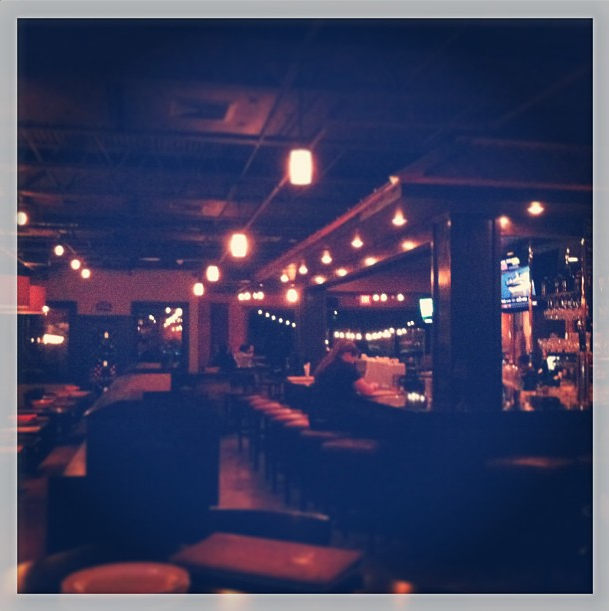 Last night, I had my first flirtation with GOOD pizza since I've been back in Houston. It was completely different from New York pizza, but man was it awesome. 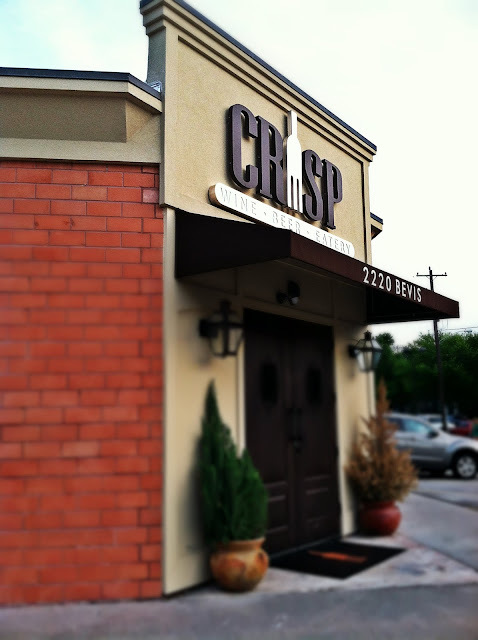 CRISP is a newer restaurant located in the Heights. The bf and I met up with my friend/"brother" Lenny (of Hyunh fame) and his wife Christy there last night. The inside of it is really cool - exposed brick everywhere (which is LITERALLY my favorite thing in the world), a 360 degree wrap-around bar, outdoor patio, and visible wine cellar. Also, It's located on Bevis St., which made Jason and I laugh the whole way there, because we're 12 year-old boys. And when we got there at 8:00 on a Friday night, it was PACKED. For as trendy as this place is, the prices weren't bad either, which I'm all about! Instagram photo taken closer to 11:00 after the crowds had cleared. Oh, also there was a guy playing the strangest mix of live music, and I totally dug it. Very cool, swanky ambiance. And we all know how cool and swanky I am. 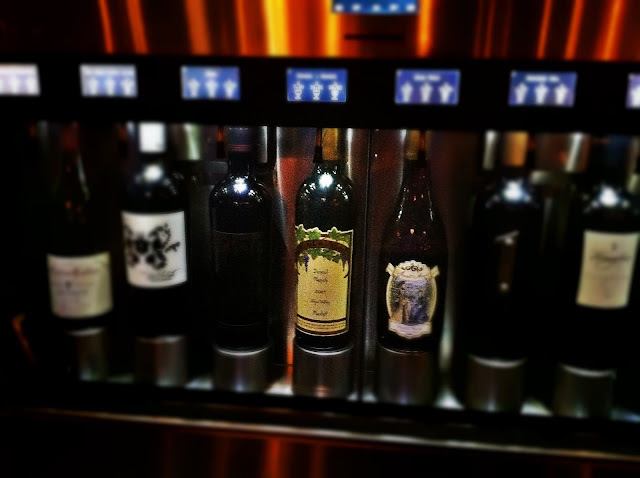 Another cool thing they have that I'll need to try one day is an enomatic wine dispensing system, which fully preserves wines, while allowing people to sample different ones before getting them. Brilliant. Even though the pizzas are big enough for 2+ people, the bf and I each got our own. He always crinkles his nose at my "fancy" pizzas, while he chows down on his meatloversexplosions, so there isn't a whole lot of room for compromise. And more for me! So I ordered the Talleggio Florentine pizza WITH prosciutto (duh. ), which was pure honey in every bite. WOW. The flavors were incredible. 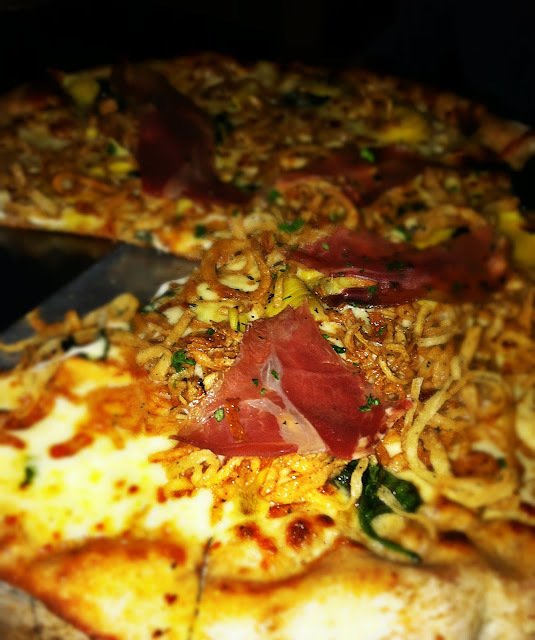 Taleggio cheese, creamy spinach, marinated artichoke, crispy onion, truffle oil, and prosciutto. These flavors came so beautifully together and were utterly delectable. If ever I cried over a pizza, this would be the one. But crying over a pizza probably falls under the Unacceptable Things to do in Public or Ever list, so I exercised restraint. The pizza that dreams are made of. 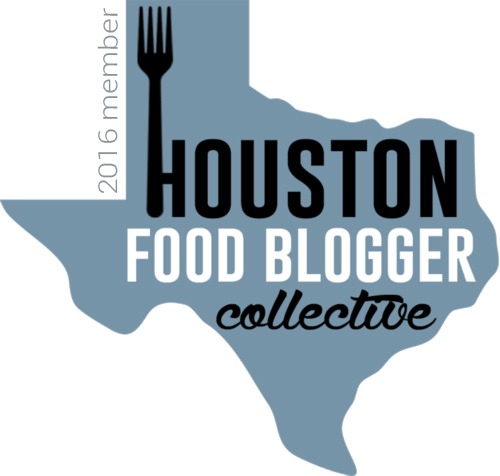 Oh, and Side Note: I LOVE truffle oil. I could put it on anything. Seriously. I might start adding it to my coffee it's that good. Okay, I just totally grossed myself out. Again, this pizza is completely different from New York pizza, but absolutely incredible. 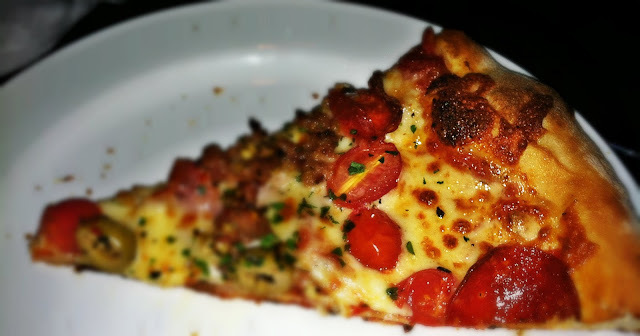 I also had a bite of Jason's San Fran's North Beach pizza (AKA: Meaty Monster Supreme). I've gotta say though, mine definitely won in terms of ohmygoddeliciousness. SO GOOD. I can't wait to have my leftovers for breakfast -- err, lunch.